Hiding away beneath the Tyne Bridge, just off The Side and across from 21 Queen Street is a new cafe, Quay Ingredient (NE1 3UG) describing itself as “a small coffee house underneath a big bridge”. Ever in the search for a perfect sandwich in town, we’ve been to QI a few times now – welcomed by an always-cheerful Maggie and having a proper chef at the helm – formerly of Irvins – it’s a canny place to grab a sandwich, proper cup of tea, and relax away an hour. Clean decor, free wi-fi, and some funky furniture make it a quiet spot to escape the hustle. 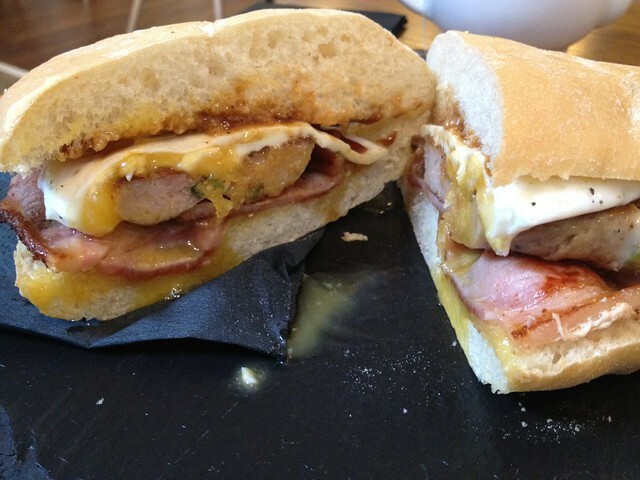 A typical cafe menu features all day breakfasts/breakfast stotties, classic sandwich combinations in a variety of breads, and a few salads and soups, all of which are promised freshly made. We’ve had a good few post-shopping sarnies now and they’ve all been winners, and come with a bag of Kettle chips – bonus. Goats cheese salad baguette (£4.75, below) is a good start, and chock full of cheese, as is a pork/leek sausage, bacon and egg stottie (£3.95, also below) – and other classics such as coronation chicken are filling, and homemade – certainly not the far too common “yellow gloop”. 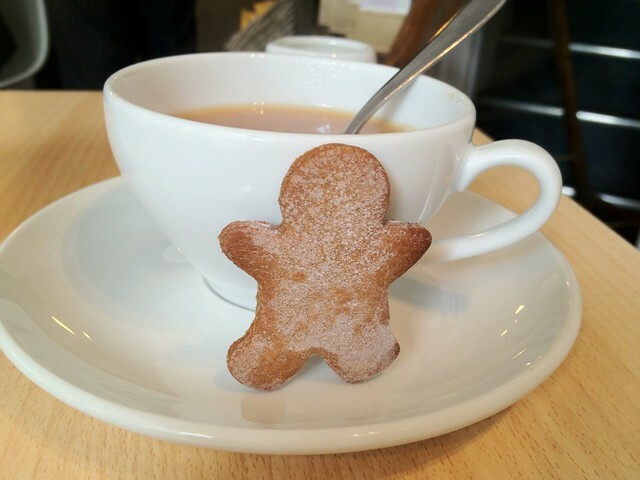 Stocking Fentimans always scores a tick (£1.80), but a real treat is that all hot drinks come with a free little gingerbread man – nice touch. Good coffee and a proper cup of tea/choice of herbal/greens from Ringtons are also a good sign, and seeing singing hinnie’s on a menu always melts our hearts a little bit. You could do a lot worse than visit Quay Ingredient for your next quick bite – reasonably priced (looking at you, Olive & Bean), quality stuff, and a stones throw away from the Quayside – there’s not too many cannier places to sit back and tuck into a decent sandwich. 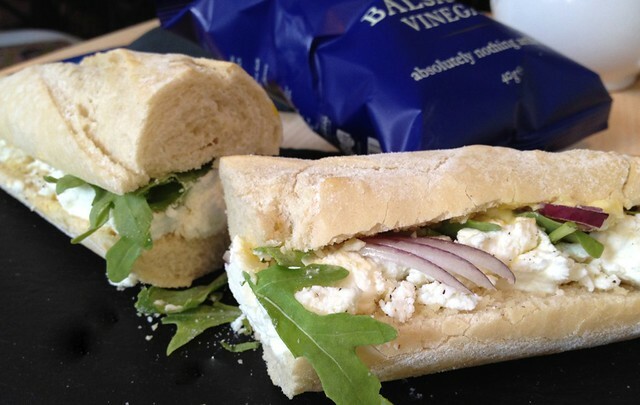 We’ll throw it out to you – where’s your favourite sandwich place?